Our new 13' Saturn Fishing Kayak is easy to carry, portable to store, and is the most versatile inflatable fishing kayak on the market today. An absolute must for any RV or camper where a fishing craft with maximum portability is critical. This model sold only at www.saturnboats.com and www.saturnrafts.com includes our upgraded C7 style valves and extra thick 1.5mm PVC floor (over $60 value). This kayak is made of the same heavy-duty 1100 Dtex PVC as our other Saturn inflatable boats and the drop-stitch high-pressure airdeck floor is the most rigid inflatable floor on the market. The floor is made to support up to 3 adults. In addition, a double layer of PVC fabric is applied to the air floor and on top of the tubes, in between the benches to prevent accidental fishing hook accidents. Our rigid high buoyancy tubes and customized floor make the Saturn FK396 kayak so stable, that you can stand up and fish if needed. The 13' Saturn Fishing Kayak comes with 2 removable aluminum benches that can be used for mounting various hardware, such as rod holders, GPS units, video cameras, dive flags, anchor mounts, and even a fish finder. 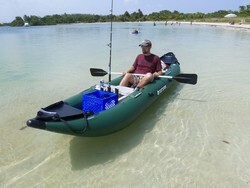 The Saturn FK396 fishing inflatable kayak is a breeze to paddle due to its narrow profile, high buoyancy exterior tubes, and rigid drop stitch floor. Please note that this kayak is not a self-bailer. It was designed for lakes, ponds, flatwater rivers, oceans and bays. If you are looking for a self-bailing kayak, no need to look any further than our 13' Saturn Whitewater Kayak. If you want this specific model and absolutely need it to be a self-bailing unit you can cut out 4-6 self bailing holes in the kayak bottom to let excess water escape. However, that option may allow water to entire above the kayak floor depending on the weight capacity. "16 months ago I purchased three kayaks - 2 FK396 and 1 SK470. Soon thereafter they were put to use. My wife and I, several of our friends, and grandchildren have paddled the boats on the Great Lakes, inland lakes and rivers in Michigan, and the Intercostals as well as rivers on the Gulf Coast of Florida. I know we have 150+ miles and many hours of paddling the boats with no problems and lots of fun times.."
"I wanted to write a quick letter describing my experience with the FK396 fishing inflatable kayak that I purchased last June. We have been using an inflatable kayak for the last four years. We purchased a Sea Eagle 330 to take with us in our fifth wheel trailer as we traveled full time around the country for approximately three years. Although the Sea Eagle did a satisfactory job most of the time, we found it wanting in several areas. I like to fish in everything from small rivers and ponds to large lakes and even inshore ocean bays. I was looking for a heavy duty inflatable that I could easily mount fishing accessories to and even possibly a trolling motor. My search took me to the boatstogo.com website where I found just what I was looking for. I must admit I was extremely skeptical when I saw the low price on what seemed to be a very high quality boat. I had seen similar boats advertised for at least twice the price but the specifications and the reviews I read convinced me to give the FK396 a try..."
Now this is a Fishing Machine! 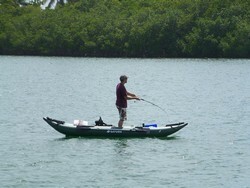 Our Saturn Fishing kayak set up by one of our customers. Heavy duty 1,100 Dtex High Strength PVC fabric coated on both side with 1100 g/m2, 0.9mm (1.5mm thick on floor). Fabric is thick, puncture and abrasion resistant.